In 2009, Palm announced the Palm Pre smartphone based on WebOS and the Touchstone inductive charger. The phone, while not a huge success, ultimately saw the inclusion of the Touchstone wireless back cover with future iterations of the device. However once the Palm Pre faded into obscurity along with its sibling devices, the concept of built-in wireless charging faded with it. 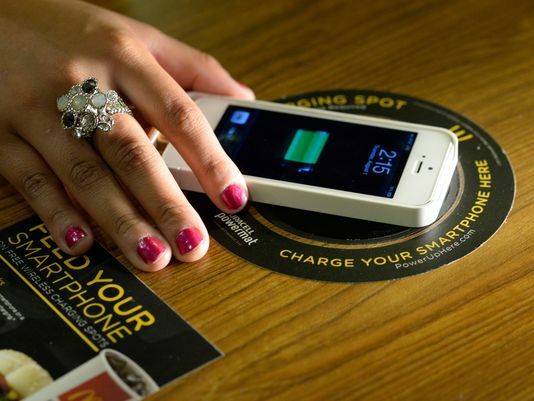 Last year, Starbucks continued their rollout test of the Powermat wireless charging standard to several Silicon Valley stores after trialing the tech in Boston. 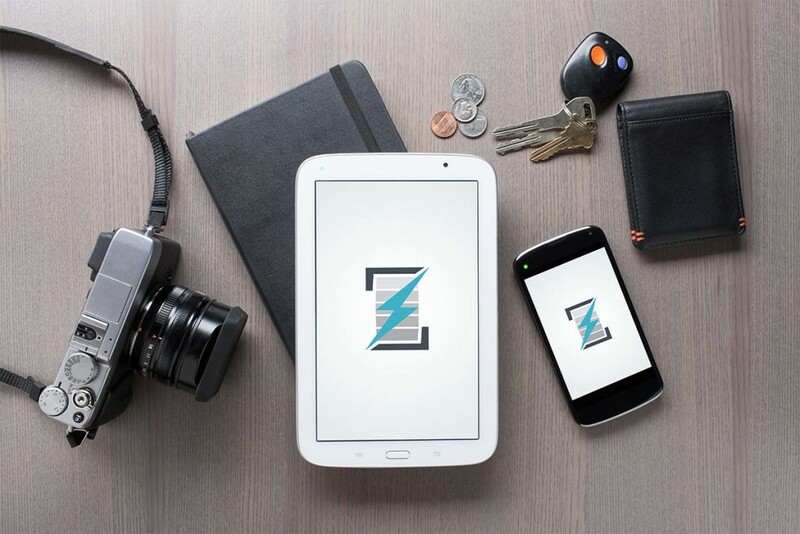 This move is fairly controversial, given the battle between the Power Matters Alliance (the owner of the Powermat technology), the Wireless Power Consortium’s Qi charging standard (pronounced “Chee”), and the Alliance for Wireless Power’s Rezence. To add to the wireless-power drama, Powerkiss, a company that originally produced Qi wireless charging dongles for phones, flipped between standards entirely when it was acquired by Powermat Technologies at the beginning of 20131. On one front, the Power Matters Alliance appears to be winning– they have integrations with several Starbucks stores around the United States, including those from the trials in San Jose and Boston, as well as several highly trafficked areas like Madison Square Garden2. Additionally, in November, The Coffee Bean & Tea Leaf announced that their LA stores would also have integrated Duracell Powermat chargers3. While the actual number of places that Powermat technology is available is quite small in contrast to other technologies such as USB charging ports, in comparison to Qi, Powermat is the clear winner. However, in order to use these charging hotspots, you must own a Powermat compatible device because none of the current standards are compatible. But there’s a catch– there are, as of publication, no smartphones or tablets with built in Powermat technology. This is a significant downfall of the technology and in order to use it, you must purchase an often bulky accessory to enable wireless charging. What’s worse is that there are few cases on the market that do not fit phones other than those from Apple, HTC, Samsung, or Blackberry. As a bonus, the cases that are available, with the exception of those for the iPhone, are usually only manufactured for older models of phones. As a result, even though there are several large venues with Powermat stations installed, you’ll see few of the chargers in use. Additionally, those that do take advantage of the Powermat hotspots will have something in common– they will be using a third-party case, almost certainly sold by Duracell Powermat, to have the privilege to use the technology. Where does that leave Qi, the second large wireless power standard? Unlike Powermat, Qi has refrained from making a big splash in the media by deploying integration trials around the world. Where Qi excels is its integrations with hardware vendors, which arguably makes the Wireless Power Consortium’s standard more appealing to consumers than Powermat. For example, Google, Nokia, and Samsung have recently released phones with Qi support or integration, including the Google Nexus 4, Nexus 5, Nexus 7, and Nokia Lumia 820. Additionally, Samsung’s Galaxy Note 3 and Galaxy S4 include support for Qi inserts and backplates. Yet, one phone remains problematic– the Apple iPhone. Without a way to change the backplate or battery of the device, it’s nearly impossible to seamlessly integrate the Qi charging standard with the phone without Apple’s official support. A clever exception to this appeared on Indiegogo at the end of 2013– the iQi. This slim adapter utilizes a thin ribbon cable to attach to the Lightning port at the bottom of the iPhone, which allows you to tuck the wireless power coil into your soft case without having extra bulk at the bottom of your device. 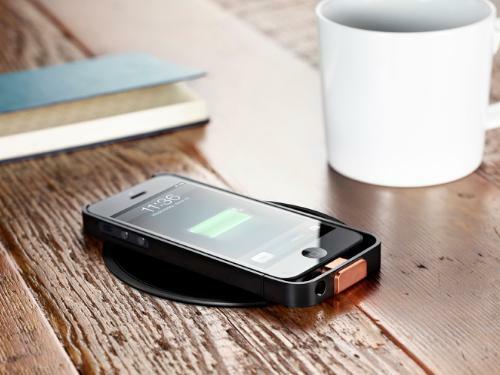 With one of the largest obstacles to widespread wireless charging use–Apple–nearly solved using Qi technology, why is it that Powermat still is largely considered a winner by the media in the wireless power war? The answer can be found in the format war between Toshiba’s HD-DVD and Sony’s Blu-ray format: marketing and integration. Unlike Toshiba, Sony had an extremely important piece of hardware that was Blu-ray compatible– the Playstation 3 game console. On top of that, Sony’s ability to produce content for the Blu-ray format made it nearly impossible for Toshiba’s HD-DVD to keep pace. It was ultimately Warner Bros. dropping HD-DVD for its content that caused the HD-DVD format to die off, but only after a long TV marketing battle between Blu-ray and HD-DVD that resulted in Toshiba’s standard being killed off4. The Power Matters Alliance clearly is attempting to win the wireless charging war through sheer brute force. Placing Powermat chargers in the consumer’s face through McDonalds and Starbucks has resulted in glowing press releases and the illusion that Powermat is vastly superior. It’s smart marketing, playing to the dream of being able to set your phone on a table while you’re getting coffee and have it charge, but ultimately it’s deceiving to the consumer when this reality is years away from fruition. Though the media primarily focuses on the war between the Power Matters Alliance and the Wireless Power Consortium, there’s a third standard that has emerged out of the battleground– the Alliance for Wireless Power, or “A4WP”. Rather than focusing on electromagnetic induction, the primary method of power transfer current Qi and Powermat chargers use, A4WP’s Rezence technology uses magnetic resonance to deliver power across distances. An advantage of magnetic resonance charging technology is the ability to provide remote electricity beyond a simple charging mat, potentially throughout whole rooms or venues. The idea of walking into your living room or bedroom and having your phone, still in your pocket, begin to charge is an idea straight out of science fiction. Potential future applications of magnetic resonance power transfer include lightbulbs or other small appliances that can be fixed anywhere in the room, without the need for wires leading to them. Even more exciting, for some home owners, is the prospect of having wirelessly charged smoke detectors that never run out of battery power. However, A4WP faces the same issues present in the battle between Powermat and Qi– adoption. In fact, A4WP’s Rezence hasn’t been developed into a product at all, and early-2014 is the earliest anyone will be able to get their hands on the technology. Fortunately, the smaller A4WP isn’t the only standards group to consider magnetic resonance– Qi plans to incorporate a backwards compatible magnetic resonance based charging platform in a future version of the standard5 and WiTricity’s membership to the Power Matters Alliance also indicates magnetic resonance as future direction for Powermat6. The magnetic resonance technology, demonstrated at CES 2014 by the A4WP, is a vital step towards widespread adoption of wireless charging. While traditional induction chargers often require careful placement on a charging pad, the second generation of Qi mats, for example, can transmit power over larger distances and with higher efficiency– up to 80%5. But recent news7 indicates that the Alliance for Wireless Power and the Power Matters Alliance have signed a preliminary agreement to work with each others’ technologies. This, along with PMA’s adoption of WiTricity, will increase difficulties for Qi. While there were previously three competing standards, there are now two. Ultimately, the war will be won by consumer awareness and adoption– not technology. While Qi has a head start on integration with phones, A4WP’s merger with PMA’s standard may lead to interesting solutions in the marketplace. If PMA-A4WP can get a product out in the market–and soon–Qi may be dead in the water. The Power Matters Alliance currently has over a hundred members 8, including Samsung Electronics, Duracell Powermat, BlackBerry Limited, HTC, Qualcomm, Starbucks, Sony, and others. The Wireless Power Consotrium has over two hundred members 9, including Samsung Electronics, Energizer, Motorola Mobility, HTC, and others.